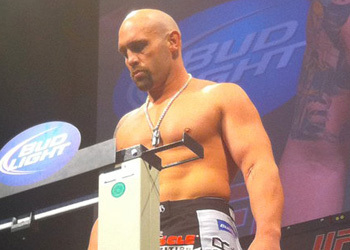 Despite having the deck stacked against him, Shane Carwin appeared to be a few strikes away from becoming the UFC’s undisputed heavyweight champ at UFC 116. Instead, Brock Lesnar rose from the ashes like a Phoenix to post a come-from-behind submission victory on Saturday night. While most anticipated Lesnar would come out with an aggressive southpaw take down arsenal, the 32-year-old opted to stand with the man that’s never been pushed past the 1stRound. Although the game plan didn’t appear too solid after Lesnar ate a left uppercut that ignited Carwin’s vicious onslaught, the former fake fighter managed to survive the opening stanza and turn the championship bout around. The W was so close Carwin could taste it. Despite a valiant and violent effort to close, the engineer appeared gassed heading into the next round. It wasn’t the way Lesnar anticipated the scrap going down, but it proved effective nonetheless. The former Division I All-American immediately secured a take down to open the 2ndRound and it was adios amigo from there. The controversial wrestler opted to bypass a dominant full-mount position and slide over to side-control. Moments later, Lesnar secured an arm-triangle choke and the former interim title holder was forced to tap before falling into unconsciousness. “I thought I had enough space to breathe and just keep working beside him, but he sunk it on tight and I was going out,” a disappointed Carwin said.